We report a chiral high-performance liquid chromatographic enantioseparation method for free α-aminophosphonic, β-aminophosphonic, and γ-aminophosphonic acids, aminohydroxyphosphonic acids, and aromatic aminophosphinic acids with different substitution patterns. Enantioseparation of these synthons was achieved by means of high-performance liquid chromatography on CHIRALPAK ZWIX(+) and ZWIX(-) (cinchona-based chiral zwitterionic ion exchangers) under polar organic chromatographic elution conditions. Mobile phase characteristics such as acid-to-base ratio, type of counterion, and solvent composition were systematically varied in order to investigate their effect on the separation performance and to achieve optimal separation conditions for the set of analytes. Under the optimized conditions, 32 of 37 racemic aminophosphonic acids studied reached baseline separation when we employed a single generic mass-spectrometry-compatible mobile phase, with reversal of the elution order when we used (+) and (-) versions of the chiral stationary phase. 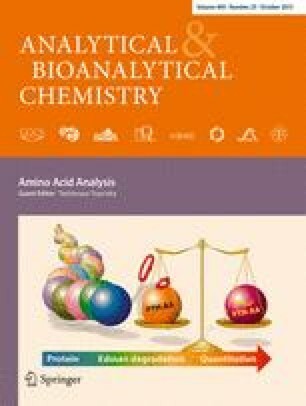 Published in the topical collection Amino Acid Analysis with guest editor Toshimasa Toyo'oka. This work was financially supported by the University of Vienna through the interdisciplinary doctoral program Initiativkolleg Functional Molecules (IK I041−N). We thank Jan Pícha (Institute of Organic Chemistry and Biochemistry, AS CR) and Friedrich Hammerschmidt (Institute of Organic Chemistry, University of Vienna) for providing several samples of APAs. We are further grateful to the Operational Program Research and Development for Innovations - European Regional Development Fund (project CZ.1.05/2.1.00/03.0058) and the project of Palacký University in Olomouc PRF_2012_020 for financial support.